The Russian military is running so low on its iconic World War II Soviet tanks Moscow was forced to ship replicas from Laos. A consignment of 30 Soviet-era T-34 tanks arrived at the eastern port of Vladivostok on New Year's Day and were taken on a long journey on the Trans-Siberian Railway to a military base near Moscow. It was thought the military vehicles have been in active service since 1987 until the famous tanks were brought back to Russia and shipped more than 2,700 miles by the Lao People's Army. Defence ministry records show that more than 58,000 T-34s were built between 1940 and 1946. But the Russian military own very few of the vintage machines, whereas the communist southeastern Asian country still holds much Soviet military hardware that was sent to aid their ally during the 1975 uprising. It is thought the batch of T-34 will be used by President Vladimir Putin to commemorate the Soviet Union victory over over Nazi Germany in World War II. 'The equipment has travelled more than 4,500 kilometres by sea and arrived in Vladivostok', the Russian military told the Moscow Times. 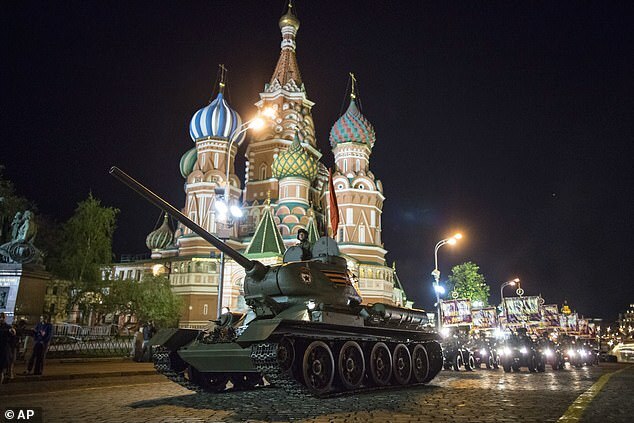 The iconic tank will take a lead role in the Victory Parade in Moscow's Red Square on May 9 and the machine is viewed by military historians as a 'war-winning weapon' for the Soviets against Germany. The deal to deliver tanks to Russia was reached in January 2018, when Russian Defence Minister Sergei Shoigu toured Southeast Asia, the New York Times reports. It is not known if Russia paid for the tanks or exchanged them for other military equipment, as a number of modernised Russian T-72 tanks were spotted en-route to Laos at the end of December. Laos' defence minister told the Russian media that Moscow was also due to send Yak-130 combat trainers and that 'several dozen' Soviet-made T-72B1 battle tanks were delivered to Laos for an unspecified sum last month. 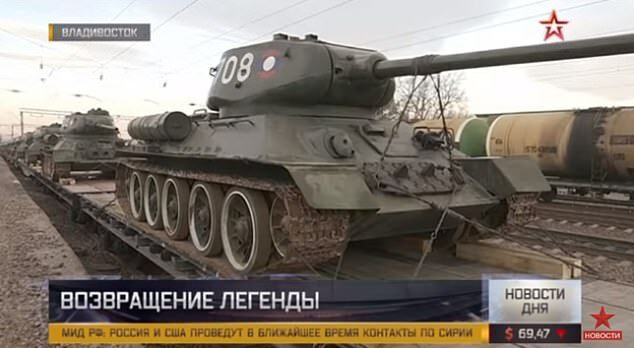 Russian TV channel Zvezda earlier said the T-34-85 provided for Laos had been manufactured in 1944 and tank battalion commander, Khampong Tummanivong, told the broadcaster his battalion had 31 tanks. A film depicting the feats of a T-34 crew broke box office records for a Russian-made film shortly before the arrival of the tanks. 'T-34' grossed more than $21 million to date, selling more than 5 million tickets. The tanks will also feature in military parades, be put in museum exhibitions and used to shoot WWII Russian movies. Talk about an iconic piece of military equipment-85 mm main gun, Christie suspension and near perfect glacis armor. Not to mention the depression capability of the main gun-must be 10 degrees or more! And a V-12 diesel that just never seemed to die. Which is probably why to this day Russian armor still uses diesels, rather than gas turbines like the M-1 Abrams . Dead reliable, easy to repair, can't kill it. Not the best build quality but hey, they were cranking them out in bombed out factories in Leningrad-DURING the siege. Hats off to the tank and the Soviet tankers who drove them. I wonder if he US Army could get 30 running M4 Shermans or Grant tanks up for a parade? So much of the WWII hardware has disappeared into the mists of history - and the scrappers. I read that there are only two operational Liberty ships left in the world and those were also produced in the thousands. I was aboard the John Brown in Baltimore some years ago, they had restored it amazingly. It is truly ironic that parts of the design of the T-34 came from an American named J Walter Christie. He tried to sell his tank design to the US Army, but they chose the poorly designed and manufactured Sherman and Sheridan tanks. the links are here. NOTE: When I was deployed to Baumholder, Germany back in 1974 we had a World War Two era Sherman tank parked out in front of HQ. It still ran, although it was a bit smoky and loud. We fired it up one day to see if it worked. I climbed inside and realized how little space there really was for the 5 man crew. I know they put it on a flatbed truck and sent it for the 30 year anniversary of the December 1944 Battle of the Bulge in Luxembourg. A few years ago up here in Portland, Searcher they had a Liberty ship come and park along the river in downtown Portland. I think its name was Jermiah? something. I paid to go on board and was truly amazed at the experience. One of the things I did was climb down this HUGE LADDER that went from the deck all the way to the engine room. So, gang I'm standing there nearly at the bottom of the ship, in this big open space with the engines etc and I'm thinking I'm surrounded by one to three inches of armor in the hull. I'm standing there, all by myself since everybody was on deck and I got what it must have felt like to be out in the middle of the Atlantic, or Pacific Ocean, pulling a shift and having no idea if a enemy torpedeo is going to come crashing through this THIN HUNK OF STEEL IN A MASS PRODUCED SHIP THAT would sink in like five minutes if you blew a hole in its side. And to get out you would have to climb this stairwell, dodging gouts of superheated steam from leaking pipes, and engine, and water pouring into the open space. Sheesh, it seriously freaked me out. The other thing I remember is they still had the 20 mm Borfors anti aircraft guns in the open turrets, and I sat in one of them and adjusted the gun a little bit. Again, you are sitting there with a Nazi Condor long range patrol plane strafing you. Yeah, they call them the Greatest Generation for a reason. Last edited by Doomer Doug; 01-11-2019 at 06:50 PM. It is impressive that there are even 2 Liberty ships left. They were built cheap and light. Their hulls were thin and they were powered by an old triple expansion steam engine. THey were obsolete during the war. They were designed to only survive a couple of years. After the war they were sold off and used hard. You are talking 70 years in a salt water environment. I think the John Brown got lucky and was used as a maritime training ship instead of a freighter. This is what probably saved her. What do you do with a bunch of cadets? Chip and paint. S.S. Jerimiah O'Brian; she's home ported at SF's Maritime Museum. I don't think the hulls were even an inch thick and they were prone to cracking. I spoke with one merchant mariner who ran to Russia. He talked about once unloading cargo and seeing daylight through a crack in the hull. The ships welder "closed" it up and they returned to the US for more. T-34's would make excellent target practice for the Tiger Ausf. B, Tiger II or Königstiger. Actually a rather high maintenance vehicle. It's rather crude construction rendered the vehicle difficult to service by conscirpts with little automotive background. 50 hours of service life was a big deal. They were turned out in large numbers however. British tanker offers a tour of the T-34/85. It's been broadcast on CSPAN a few times now, but for those of you who don't watch it, here you go. Thanks to Wargaming Seattle for the cameraman. "What's in a name" Two parts. US Guns, German Armor. Two parts. The disconnect between the view of dealing with German AFVs in MTO at ground level vs General level.